‘Tis the season for making resolutions and setting goals. Try exploring these three areas to dig deeper into QuickBooks Online. QuickBooks Online’s app replicates a surprising percentage of the features found on the browser-based version. You can create, view, and edit invoices, estimates, and sales receipts, for example, as well as see abbreviated customer and vendor records. Your product and service records are available there, including tools for recording expenses on the road. 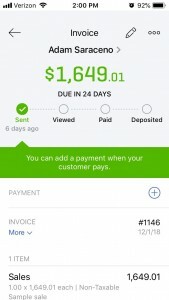 Did you resolve to grow your understanding of QuickBooks Online in 2019? We can help you explore new features.Go mobile in 2019: Download the QuickBooks Online app for your smartphone. You’d be surprised at how much it can do for you while you’re on the go.How are things going with your 2019 budget? If you don’t have one yet, let us show you how QuickBooks Online simplifies this critical task.